She's the sword-wielding Guardian for the Goblet of Eternal Youth, which is currently masquerading as a shape-shifting espresso machine in a fancy New York City condo. 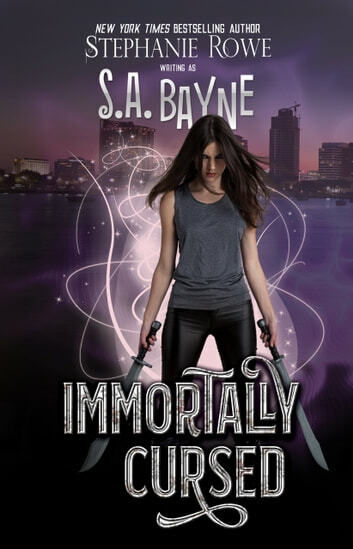 Being an immortal badass in the City that Never Sleeps soundsexciting, but Justine hasn't gotten to behead anyone in centuries, the celibacy oath she took two hundred years ago is getting to her, and her dead mom is being hotly pursued by a lovesick Satan. About the Author: S.A. Bayne (aka Stephanie Rowe) is a gift to the universe, at least according to her dogs, and everyone knows dogs are world-class judges of people. She was taught to play by the rules, but after suffering numerous apoplectic breakdowns, she realized that she had to ditch the rules, figure out her own way to live, and then turn that into a high-octane, irreverent, unpredictable-as-hell, paranormal that will make your day so much better just by reading it. And yes, she is also New York Times and USA Today bestselling author Stephanie Rowe, winner of the 2018 RITA® Award for Best Paranormal Romance. Because she's nifty like that. For more info, check out www.sabayne.com or www.stephanierowe.com.